Bailey, Patricia G. and Donald J.c. Phillipson. "David Suzuki". The Canadian Encyclopedia, 19 October 2018, Historica Canada. https://www.thecanadianencyclopedia.ca/en/article/david-suzuki. Accessed 19 April 2019. Image: The Canadian Press/© Films Canada/courtesy Everett Collection. Sturla Gunnarsson's documentary Force of Nature is about leading environmentalist David Suzuki. (Photo courtesy of Sturla Gunnarsson). David Suzuki and his twin sister, Marcia, were the first of four children born to second-generation Japanese Canadians. His father, Carr Kaoru Suzuki, and mother, Setsu Nakamura, owned a dry-cleaning shop in the Marpole neighbourhood of Vancouver. Their third child, Geraldine, was born in 1938. In 1942, while Canada was at war with Japan, the federal government forced all Japanese Canadians off the West Coast, effectively declaring them enemy aliens (see	Internment of Japanese Canadians; Japanese Canadian Internment: Prisoners in Their Own Country). Carr Suzuki volunteered to leave Vancouver to help build the Trans-Canada Highway, hoping to reassure authorities that he was loyal to Canada, his country of birth. The effort was in vain: the rest of the family was forced to move to an internment camp in Slocan, British Columbia, and had to give up most of their possessions. Their new home was one room in a dirty, run-down old hotel. 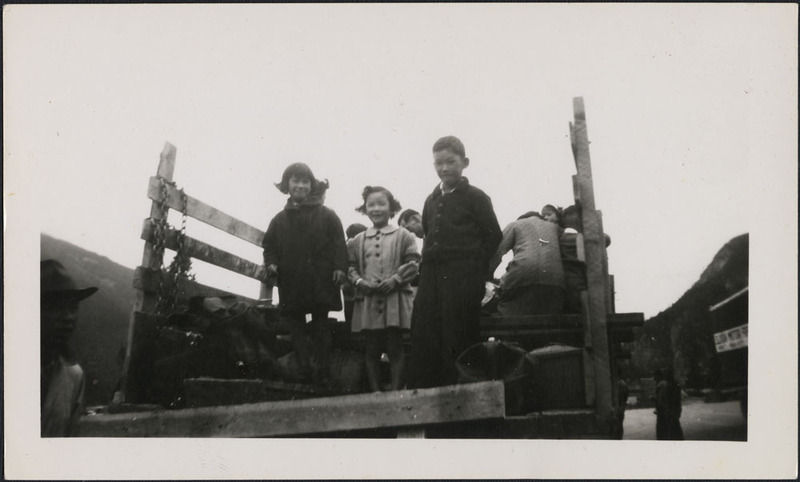 David Suzuki and two of his sisters in an internment camp in Slocan City in the British Columbia interior, between 1942-1945. In Slocan, the family’s fourth child, Dawn, was born. A year into their incarceration, a school opened. David began Grade 1. He was an avid student who did well in class. In David Suzuki: The Autobiography, he relates mixed memories of this time. The Slocan Valley was a “paradise” with its wilderness and wildlife, but he was bullied by other children in the camp because he could not speak Japanese. Toward the end of the war in 1945, the Suzukis were moved to another camp in Kaslo, BC. After the war, the family was forced to leave the province, resettling in Leamington, Ontario, where they were the first visible minority family in the small community. In 1950, they moved to London, Ontario. In 1945, Prime Minister William Lyon Mackenzie King	issued an order-in-council giving Japanese Canadians two options: resettle east of the Rocky Mountains	or choose “repatriation” to Japan once the war ended. The Second World War restrictions prohibiting Japanese Canadians from living within 160 km of the British Columbia	coast were not lifted until 1949. My loneliness during high school was intense… My main solace was a large swamp a ten-minute bike ride from our house. Any marsh or wetland is a magical place, filled with mystery and an incredible variety of plant and animal life. After high school, Suzuki attended Amherst College, in Massachusetts, where he received a Bachelor of Arts in biology in 1958. He went on to study at the University of Chicago and in 1961 graduated with a PhD in zoology, becoming a geneticist. Suzuki was a professor at the University of Alberta	in 1962–63 before joining the University of British Columbia, where he would remain for the rest of his academic career. In 1969, he won a Steacie Memorial Fellowship as the best young Canadian scientist. He specialized in meiosis, the early division of living cells where differentiation begins (e.g., between reproductive and other cells), and the study of mutations caused by changes in temperature. In 1971, the CBC TV series Suzuki on Science began to make him a public figure. While continuing his university	teaching and research in genetics (his work on the fruit fly earned him worldwide recognition), he wrote widely on science and science policy, became the first host of the radio series Quirks and Quarks in 1975, and served on the Science Council of Canada. Suzuki was convinced that public awareness of science would contribute to both better science policies and an enriched culture. 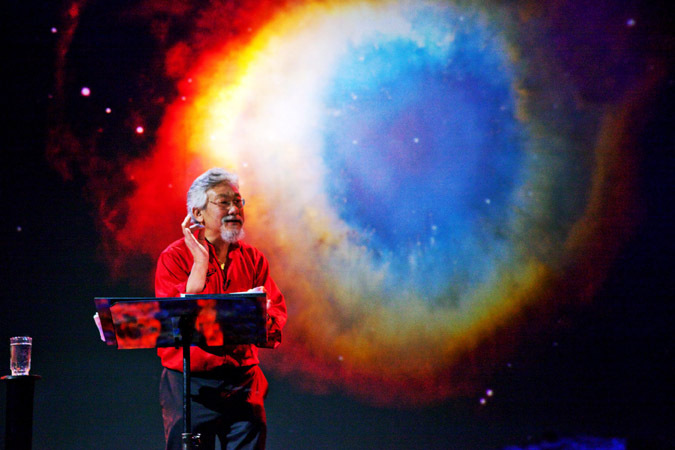 His rare combination of personal charm and scientific ability, as displayed in The Nature of Things (the longest running documentary series on CBC-TV), has made Suzuki a unique figure in English-speaking Canada. His popular 1985 CBC special, A Planet for the Taking, drew 1.8 million viewers per episode and received the Environment Programme medal from the United Nations. Geneticist and host of CBC-TV's "The Nature of Things" (courtesy CBC Television/Fred Phipps). Suzuki also developed a number of science television series with international broadcasters. For example, he worked with the British Broadcasting Corporation (BBC) and the Public Broadcasting Service (PBS) on the series The Secret of Life (1993), and with the Discovery Channel on The Brain (1994). In 2008, Suzuki and his youngest daughter, Sarika, launched a CBC-TV show, The Suzuki Diaries, about sustainability issues around the world. The father and daughter team first visited Europe to discuss the equilibrium between human needs and planetary limits. The second instalment in 2009 focused on coastal Canada. David and Sarika met with scientists, fishermen and leaders on all three of Canada’s coasts to discuss the health and sustainability of Canadian coastlines. In 2014, Suzuki launched the Blue Dot Tour alongside celebrities such as Margaret Atwood, Neil Young, Raine Maida and Emily Haines. The 20-event tour spanned the country and publicized the fact that Canada does not officially recognize the right to live in a healthy environment, unlike more than 110 other countries. The tour aimed to promote the inclusion of this right in the Canadian Charter of Rights and Freedoms. Media releases for the tour suggested it might be Suzuki’s last. The winding down of Suzuki’s career speaks in part to his age, but perhaps also to a sense of frustration and defeat. “We fundamentally failed to use those battles to get that awareness, to shift the paradigm,” Suzuki told Maclean’s magazine in 2013, speaking of the environmental battles activists waged in the 1970s and 1980s. “And that’s been the failure of environmentalism.” He nevertheless continues to write a weekly column on environmental issues, Science Matters, which appears on the David Suzuki Foundation website and in publications across the country. Despite being one of Canada’s most celebrated scientists and environmentalists, David Suzuki has drawn backlash from critics who view his activism as harmful to Canadian industries	and jobs. In 2018, some business leaders, donors and University of Alberta faculty members spoke out against the school’s decision to grant Suzuki an honorary degree. They objected to Suzuki’s view that “the tar sands have to be shut down.” The controversy was particularly heated because it emerged during a tense national debate on the Trans Mountain pipeline expansion	project. Even Alberta premier Rachel Notley	voiced her disagreement with the university’s decision. From 1958 to 1966, David Suzuki was married to Setsuko Joane Sunahara, whom he began dating in high school. The couple had two daughters, Tamiko and Laura, and a son, Troy. Since 1972, he has been married to writer Tara Cullis, with whom he has two daughters, Severn and Sarika. Cullis is also president and co-founder of the David Suzuki foundation. Suzuki is the author or co-author of more than 50 books. Nearly 20 of these works are for children, including You Are the Earth (1999) and Salmon Forest (2003). Other titles include his two autobiographies, Metamorphosis: Stages in a Life	(1987) and David Suzuki: The Autobiography (2006), as well as The Legacy: An Elder’s Vision for Our Sustainable Future (2010) and Letters to My Grandchildren (2015). Suzuki has received many honours and awards. These include five Gemini Awards for his work in Canadian television, as well as the 2002 John Drainie award for broadcasting	excellence. He has 29 honorary degrees from universities in Canada, the United States and Australia. In 1986, he received the Royal Bank Award	and the UNESCO Kalinga Prize for the Popularization of Science. In 1995, he received the Order of British Columbia. Suzuki was named an Officer of the Order of Canada	in 1976 and was elevated to Companion in 2005. He received a lifetime achievement award from the University of British Columbia in 2000. In 2009, he won the Right Livelihood Award (known as the “Alternative Nobel Prize”), which recognizes outstanding vision and work for the planet and its people. Suzuki was inducted into Canada’s Walk of Fame in 2017. See also: David Suzuki (Interview) ; David Suzuki (Profile). 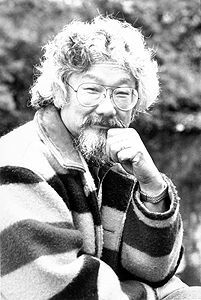 David Suzuki, David Suzuki: The Autobiography (2006). 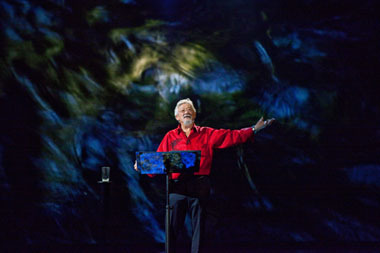 David Suzuki, Ma vie (2007). Force of Nature: The David Suzuki MovieDownload this feature documentary film about the life and work of David Suzuki on the National Film Board website. Une force de la natureUn long-métrage documentaire portant sur la vie et sur l'œuvre de David Suzuki. Disponible sur le site de l'Office national du film.